The works of the English poet Elizabeth Barrett Browning enjoyed great popularity during her lifetime. Her most enduring poetry has proved to be Sonnets from the Portuguese. Elizabeth Barrett was born on March 6, 1806, near Durham. She was the eldest of the 12 children of Edward Moulton Barrett, a possessive and autocratic man loved by his children even though he rigidly controlled their lives. Though she never received any formal education, Elizabeth was a precocious reader, and she began writing poetry at an early age. In 1819 her father had printed 50 copies of her epic "The Battle of Marathon," which she later referred to as "Pope's Homer done over again, or rather undone." In 1826 she published anonymously An Essay on Mind, with Other Poems, an attempt, as she later noted, to survey history, science, metaphysics, and poetry from classical Greece to the Victorian day in 88 pages. Elizabeth's youthful happiness was not to last. In 1821 she began to suffer from a nervous disorder which was to cause headaches, weakness, and fainting spells for the rest of her life. Barrett continued her poetic career in 1833 with the anonymous publication of Prometheus Bound: Translated from the Greek of Aeschylus, and Miscellaneous Poems. Two years later, the Barretts moved to London and in 1838 settled permanently at 50 Wimpole Street. In the same year Elizabeth published her first book under her own name, The Seraphim and Other Poems. Though these poems are often filled with heavy-handed pathos and moralizing, the critics hailed her as a new poet of "extraordinary ability." In 1838 Barrett became seriously ill. Two years later her favorite brother, Edward, drowned, and this shock seriously aggravated her poor health. For the next 5 years she remained in her room and saw no one except her family and a few close friends. In 1844, however, the publication of Poems secured her fame. Such poems as "The Dead Pan" and "Lady Geraldine's Courtship" seem strident and sentimental to modern readers, but they were very popular with Victorian readers and won high praise from critics in England and the United States. But the most significant result of Poems was the beginning of Barrett's relationship with the poet Robert Browning. Attracted by her praise of his poetry, Browning wrote to her on Jan. 10, 1845, and thus began England's most famous literary love affair. Barrett's illness had led her to feel "completely dead to hope of any kind." Her progress out of this despair to hope and finally joy can be traced in her letters to Browning and in her Sonnets from the Portuguese, written during their courtship and expressing her love for him. Because Elizabeth's father had forbidden any of his children to marry, the couple were secretly married on Sept. 12, 1846. In anger and frustration, Mr. Barrett refused ever to see his daughter again. The Brownings journeyed south through France to Italy. Casa Guidi in Florence was their home for the rest of Mrs. Browning's life. There her health was so improved that on March 9, 1849, she gave birth to a son, Robert Wiedeman Barrett Browning. In 1850 Browning issued a revised edition of Poems containing the Sonnets from the Portuguese, which her husband had urged her to publish. Modern readers usually find these sonnets her best work. But Victorian readers much preferred her Aurora Leigh, a long poem in blank verse published in 1856. The major interest of Browning's later years was the Italian struggle for unity and independence. Both Casa Guidi Windows (1851) and Poems before Congress (1860) attempted to win sympathy for the Italian cause. On June 29, 1861, she died quietly in her husband's arms, with a "smile on her face." The best biography of Mrs. Browning is Gardner B. Taplin, The Life of Elizabeth Barrett Browning (1957). Also useful is Dorothy Hewlett, Elizabeth Barrett Browning: A Life (1952). A detailed and moving account of the courtship of the Brownings can be obtained from The Letters of Robert Browning and Elizabeth Barrett, 1845-1846, first edited by their son (2 vols., 1899) and recently re-edited by Elvan Kintner (2 vols., 1969). More of Browning's extensive correspondence is collected in Sir Frederick G. Kenyon's edition of The Letters of Elizabeth Barrett Browning (2 vols., 1897). 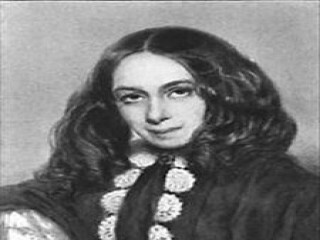 View the full website biography of Elizabeth Barrett Browning.